Does anyone know anything about a NYC wreck in Oakfield in the early 1950's? apparently 2 trains struck head-on. Oakfield is just north of Batavia. Scott: There was another wreck in Oakfield. ConRail locomotive #6483, unmanned, derailed in Oakfield on Monday, 03 September 1979 (Labor Day) after traveling from West Seneca. The unit had been tied down in West Seneca when a person unknown started it up and put it in motion. This info from the Rochester D&C of September 5, 1979, page 2B. I believe the wreck Scott is referring to actually was a double headed frieght on 4/17/42 and not a headon collision in the Fifties. Eastbound trains often had a helper from Gardenville as far as Oakfield, where they cut off, turned on the wye near USG and returned. This particular train was a 93-car, 7,000 ton frieght on route from Gardenville to Dewitt. The road engine was L-2 2754 and the Helper was 2-8-2 1311, which for some reason was cut in behind 2754. The beginning of single track was just before the South Pearl Street grade crossing where there was also a signal and a derail. Newspaper accounts speak of the derail as being on a siding, but I don't know if this was an actual siding or the eastbound track as Oakfield was the end of double track from Gardenville. The lead engineer, Frank Eigenman, said he started to apply brakes so the helper could be cut out and found the brakes would not hold. The train hit the derail and after about 250 feet, 2754 turned over on its right side. 1311 remained upright but off the rails and its tender jack knifed to the left of the engine and killed fireman Harold Ferris, who was making only his second trip. Only a few of the cars behind the locomotives derailed. The head brakeman suffered a sprained ankle, but there were no other injuries. Six sectionmen were in a nearby section house which was partially covered by coal from 2754's tender but also escaped injury. I don't believe there was ever a head on in the Oakfield area. The only significant wreck in the fifties was on 9/27/58 when HB-1 derailed 35 cars in Basom several miles to the west. Has anyone ever seen the ICC report for the l942 wreck? Strange, the only ICC reports shown for 1942 for the New York Central were on 10/11 at Marcy, OH and 11/11 at Ossining, NY. There was one for the NYC and Wabash. But that was not for NYS. Train Yourself To Relax...Ride The New Haven RR! The New York, New Haven & Hartford Railroad! Serving New York and the Great Industrial States of Massachusetts, Rhode Island & Connecticut! This line that went west of Oakfield, was that part of the West Shore? And what, if anything, remains of that stretch of track today? That was the West Shore, indeed. Up until recently, there was track from just west of Harris Hill Road in Amherst(?) just near the quarry to just east of the Buffalo airport. The tracks had not seen trains in years however. I think a tiny part may still see service by CSX (there is a connecting track to it by the Depew Amtrak station on the main). From Oakfield to the quarry, I think the last trains ran in the early to mid-1980s. If I missed something......speak up! The track west from Oakfield was the New York, West Shore & Buffalo all the way across New York and down the west shore of the Hudson River built in 1882-83. Service through Oakfield was started 1/1/84. After the New York Central installed CTC on the main line beginning in the late Fifties, the West Shore lost its value as a secondary route for drag freights and was downgraded and torn up in various stages. The only sections left are between Chili Jct. and Fairport, which is used to bypass Rochester, and also the trackage around what became Selkirk Yard. Track from Byron to Chili Jct. and also a large section between Wayneport to near Syracuse went out of service on 1/1/60. The track from Oakfield to Byron only lasted until l963. Conrail stopped running trains to Oakfield in early l984. Approval was given to dismantle the West Shore Pearl Street, Oakfield to Lancaster (22.10 miles) on 15 January 1985.
charlie6017 wrote: That was the West Shore, indeed. Up until recently, there was track from just west of Harris Hill Road in Amherst(?) just near the quarry to just east of the Buffalo airport. The tracks had not seen trains in years however. I think a tiny part may still see service by CSX (there is a connecting track to it by the Depew Amtrak station on the main). From Oakfield to the quarry, I think the last trains ran in the early to mid-1980s. If I missed something......speak up! 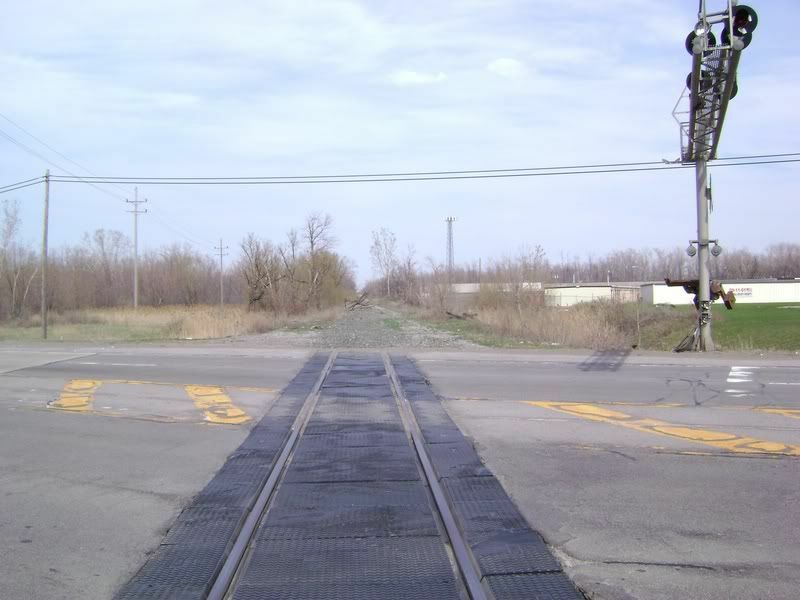 According to the most recent issue of Railpace, RJ Corman is removing the former West Shore between Cheektowaga and Clarence. RJC had purchased the line to store rail cars and the quarry (Buffalo Crushed Stone) wanted to ship via rail but the town of Clarence shot down the storage proposal. A few groups protested but the local officials did nothing to stop the formal abandonment process in 2002. 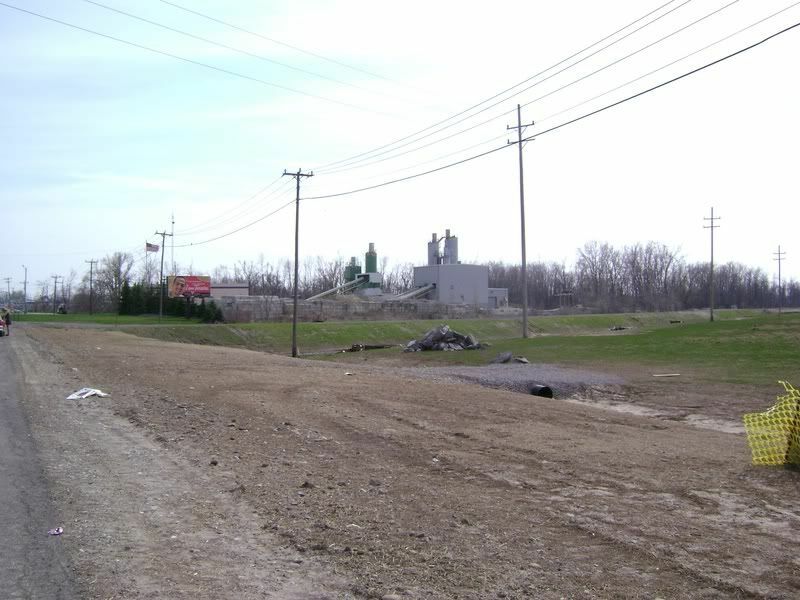 Also - in Macedon, a small part of the West Shore still exists to serve the plastics plant there (about a mile or two). Photo taken by me 4/19/2008. Photo taken by me on Saturday 4/19/2008 in Depew, NY. My chase vehicle is the Saturn on the shoulder of the road. 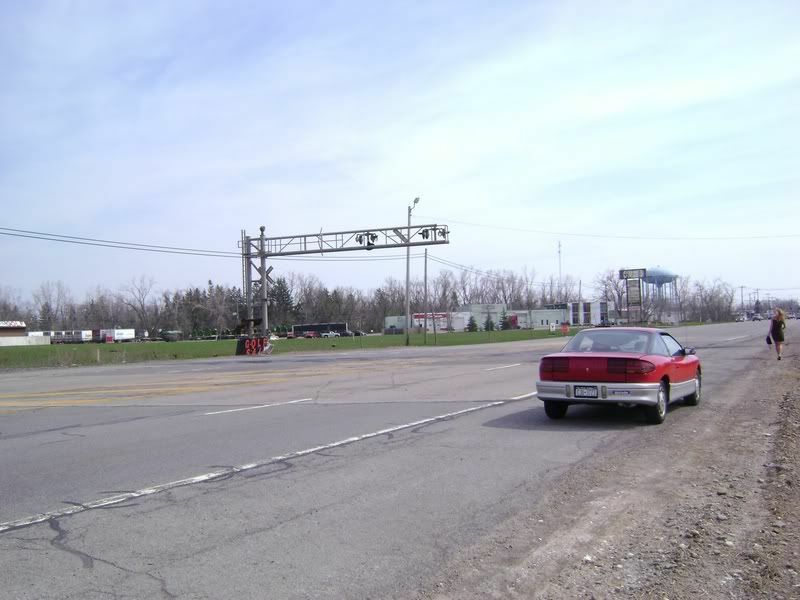 The grade crossing was a NYSDOT project, and generally they leave them in place until the next major road construction project. First, he really wasn't shooting the railroad crossing. Second, that was his girlfriend, and she said, "Matthew, if you take one more picture of a railroad that is not there anymore, I'm leaving!" "See ya!" Last edited by railwatcher on Mon May 19, 2008 9:09 am, edited 1 time in total.